If you have shopped with us before you will most likely already know that Cartridge Save are affordable on the price of Xerox 5500DX toner cartridges. Every single order made for this Xerox Phaser 5500-DX toner is totally backed by Cartridge Save's low cost policy so the price you'll see is what you'll pay! Cartridge Save supplies high quality toner for the Xerox Phaser 5500-DX printer that have been stringently put through their paces by experts in order to guarantee solid functionality. Cartridge Save will give you with a money back guarantee on each Xerox Phaser 5500DX toner cartridge so you'll not ever need to settle for a dysfunctional cartridge. Remember, we offer fast and free on Xerox Phaser 5500DX toner cartridges to help save your money. Buying your Xerox toner from Cartridge Save couldn't possibly be cheaper or easier. Our efficient support team will take care of your purchase each step of the ordering process. Get your order in now! The large Xerox Phaser 5500DX is a monochrome laser printer that comes with finishers and other productivity features including booklet printing and PDF direct print. This workhorse has a standard memory of 256 MB but it can be upgraded to 512 MB. It is also integrated with a 20 GB internal hard drive and 500 MHz processor. Print resolution can go as high as 1,200 x 1200 dpi. 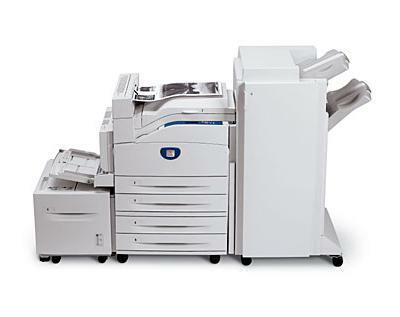 The Xerox Phaser 5500DX black and white printer can deliver 300,000 pages per month. Wi-Fi connectivity is not offered by the Phaser 5500DX. This impressive unit has a 50 ppm speed for both simplex and duplex mode with the first page coming out in 7 seconds. The Xerox Phaser 5500DX monochrome laser printer has a maximum paper handling capacity of 5,100 sheets and it also has a 3,500 sheets finisher with hole punching and stapling. USB, Ethernet, and parallel connectivity and a small control panel are offered. The Phaser 5500DX laser printer is designed to use the black Xerox 113R00668 laser printer cartridge. The robust Xerox Phaser 5500DX workgroup laser printer is very reliable and it delivers consistent output. Users can expect crisp and professional text documents and greyscale images. This unit is very easy to use and maintain and it has high monthly duty cycle. It can help save time and resources with its high paper handling capacity and its built-in duplexer. The Xerox 5500DX mono laser printer can be easily shared in a workgroup as it has Ethernet and is compatible with Macintosh and Windows computers. This printer is quite large for small offices and it is very pricey. The Xerox 5500DX Phaser printer does not offer wireless LAN connectivity.